Aeration is very important when it comes to maintaining a healthy lawn. It ensures that the ground is breathable and improves the soil drainage for a healthier growth of grass and plants. To achieve the best results you need a good manual lawn aerator and that’s where we come in. A lawn aerator is special garden tool used for poking holes in the soil to enhance air circulation and expose the grass’ or plants’ roots to nutrients and water to promote healthy growth or quickly bring them back to life. It’s a simple but effective device. Lawn aerators use either spikes or plugs to aerate the soil. They both cut through the ground and thatch breaking up compacted soil and exposing the roots of the grass to water and nutrients. Who Will Need A Lawn Aerator? If your lawn gets very heavy traffic or heavy usage like kids running around regularly or people pass through it more often, and you’ve noticed excessive thatching or that the soil has started drying out quickly or feeling spongy, then you may need to get a lawn aerator to restore it to its proper condition. Drainage problems especially like puddles of water remaining all over your lawn after it rains are also indicative of a compacted lawn and a need for aeration. Even without any kind of symptoms, you need to aerate your lawn at least once year to keep it healthy. What Is A Core (Plug) Aerator & How Does It Work? A core aerator is also known as a plug aerator and it has hollow spikes that remove a chunk of the compacted soil to allow oxygen, water and other nutrients to reach the roots so as to accelerate the growing process. It has long hollow tines which you push into the ground. The tines penetrate the ground and pull out soil plugs leaving the lawn perforated with small holes. The process breaks up the compacted soil and redistributes the resulting soil across the lawn surface. The resulting holes provides easier access for the nutrients and water to reach the roots hence promoting root growth. It’s perfect for aerating a heavily compacted lawn. What Is A Spike Aerator & How Does It Work? 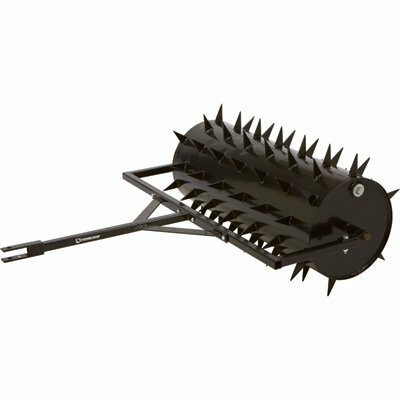 A spike aerator is an aerator that has long, sharp, solid spikes that penetrate into the soil without removing any soil. The sharp, solid spikes pierce into the grass and soil once pulled or rolled over the lawn and create small voids by pushing the soil down to allow for air, water and nutrients to go through and reach the root system. Here we are going to look at some of the best lawn aerators that will no doubt help you aerate your lawn with much ease. Our comprehensive review narrows down on the top manual lawn aerators available on market to six and gives a detailed overview of what each model offers. Also included is an informative guide to help you select the best option with great confidence. Read through and you can rest assured that you will get the lawn aerator that will suit your particular needs and desires. What are lawn aerator shoes? Lawn aerator shoes are basically slip-on coverings featuring spikes which are used to poke little holes into compacted soil so as to increase water flow and oxygen to grass’ and plants roots. 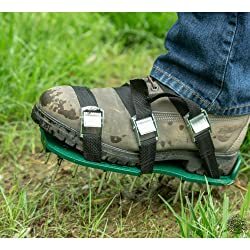 Lawn aerator shoes are designed such that you can wear them over a pair of casual shoes and they have adjustable straps to secure them in place. They use solid spikes to create small holes into the compacted soil. They are very easy to use and all you need to do to aerate is to wear them, then walk across your entire lawn. With each step, the spikes which are attached at the bottom dig deep into the soil and grass creating little holes all around you lawn. With that said, topping our list is none other than the Panchau pre-assembled lawn aerator shoes. These are the best aerator shoes you can find out there. They are heavy duty and have some amazing features that make them really stand out compared to the rest. The shoes are designed to be highly effective and will aerate the soil excellently to permit water, fertilizer and air to reach deep down to the roots. The 13 spikes attached at the bottom are very strong and sharp measuring up to 2 inches long. They will dig deep into the soil without you even having to stomp through the lawn with great force. They are also firm and well secured, hence they are not likely to come off when you are busy working. The base itself is made of a heavy gauge plastic and with the thirteen strong spikes attached to it, it’s very durable and quite sturdy. While other aerator shoes use plastic buckles that are often flimsy and break easily over time, this Panchau model use strong metallic buckles that won’t break. They will last for quite a long period compared to the plastic buckles. You will also be able to secure them firmly to your shoes. The straps are heavy duty as well and they are 3 instead of 2 like in other aerator sandals. As such, they offer more coverage and once fastened, they will hold your feet firmly in place for a tight and secure fit. Furthermore, the sandals are one size fits all. Therefore, no matter the size of your feet, they will fit well to your regular footwear and give you enough comfort. The best part is that they come full assembled which makes them really convenient and quick to use. All you need to do is to put them on, fasten the straps and you are good to go. In short, these Panchau lawn aerator shoes are built to very high standards with very effective, durable spikes. Considering that they are also highly affordable, these are no doubt the best aerator shoes you can invest in. They will give you complete control over the aeration process and deliver great results too. If you are looking for the best handheld core (plug) lawn aerator, then this is it. The Yard Butler ID-6C might look simple but it is one effective manual aerator that’s capable of reducing the amount of compact in almost any type of soil. To start off, with its easy design and style, the ID-6C allows you aerate your lawn quickly and effortlessly. All you need to do is to put your foot on the step bar and drive the two hollow tines into the ground and extract two plugs of soil and thatch. The platform between the tines makes it quite easy to drive them into the ground. The ends of the tines are slanted not straight. They are sharp enough to penetrate into the ground without much resistance. They are 4-inch long and remove two plugs of soil leaving around 3.5 inch holes. It removes dirt from the soil rather than just driving a spike through allowing air, water as well as fertilizer to get deep down to the roots of the plants or grass on your yard. The handle is covered with a non-slip rubber paddings that offer a comfortable and firm grip. You are definitely not going to develop blisters while you are busy at work driving the tines deep into the ground. The main frame is a strong, all steel construction. It’s very solid together with the foot bar and the tines. They will withstand great abuse and can handle even dry, almost rock-like soils. It can deeply penetrate the soil. In fact the more force you put, the deeper the tines will dig into the soil. Another thing you are going to appreciate is its height. 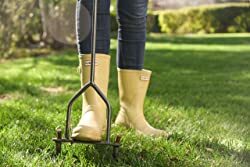 It’s 37-inch long, so it’s fairly tall which will help reduce back strain and sprain, especially when you choose to aerate your whole yard. The only caveat is that it doesn’t come with a collection bag. You will have to either leave the removed plugs of soil on the ground to dissolve or collect them by hand. Other than that, everything else is perfect. If you have a smaller lawn and want a simple but effective aerator, then the Yard Butler ID-6C is a great choice for you. It’s a reliable, solid and durable tool that offers great value for money. What Is A Walk Behind Lawn Aerator? A walk behind lawn aerator is one that you operate by pushing while following from the rear end as you hold it. They offer a very convenient way of handling the machine while it’s in action. In order to aerate with a walk behind aerator, you basically just have to push it up and down your entire lawn. They work more efficiently on wet soil and are also safe to use on slopes. They provide a much faster operation which makes them ideal for small or fairly large lawns and you can redo the aeration as often as you like. The Best Choice Products rolling lawn aerator is our best walk behind (rolling) aerator. For those who are looking for an ideal walk behind aerator, then this is a unit you might want to consider. It’s an efficient lawn aerator that’s easy to use, a perfect choice if you are planning to do regular lawn aeration and your lawn is fairly large. The unit is lightweight weighing around 7.94 pounds, therefore it won’t need much force to move it around, especially in soft soil areas. 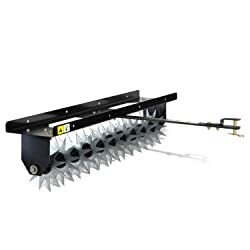 The spiked roller has 26 spikes spread out across its 14-inch width which punch holes onto the ground to let in air, water and nutrients into the subsoil and the roots of the plants and grass. The spikes are very strong and sharp with a length of about 2 inches which is long enough to penetrate deeply in to the lawn and pull dirt up. They are quite thick too and will make sizeable holes in the soil to allow sufficient air and oxygen to pass through. The 14-inch roller is not that large but it’s adequate enough to allow you cover more ground quickly. Plus it has some weight in it, so it will do a great job penetrating the lawn especially when you dampen the soil but otherwise, you may need to apply a little pressure behind it. The whole unit is simply well built using strong steel and high grade plastic. It will withstand heavier use and probably last longer. It’s also quite easy to assemble. One of the downside of this unit however is that it may not perform well on a dry land. It works best when the ground is wet. In addition, the handle is not the most comfortable one. If it was a T-handle it would be much easier to hold. Generally, this is a great, durable and effective tool, best used when the yard or lawn is wet and damp. What Is A Tow Behind Lawn Aerator? 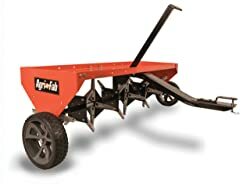 A tow behind aerator is basically an aerator that you drag behind and comes with a hitch which you can hook up to a tractor or lawn mower. They are pretty big ranging from 42 inches to 48 inches. It can have hollow tines or sharp spikes. A tow behind core aerator operate by using hollow tines to penetrate the lawn and utilize coring process to remove plugs of soil as well as thatch from the lawn which allows water, nutrients and air to reach the roots. A tow behind spike aerator on the hand use sharp solid tines to poke holes into the soil as you pull it through the lawn. The Agri-Fab 45-0299 is without a doubt the best tow behind core aerator out there. It’s a powerful and strong model which will deliver the best results possible when it comes to aerating your garden. It’s ideal choice for those who need a big manual lawn aerator. This pull behind aerator comes with 8 spools each having 4 robust galvanized tines. They have fairly sharp ends and can reach up to three inches deep into the surface. They will effectively penetrate any compacted soil and remove plugs from the lawn facilitating air and moisture to reach the roots of your lawn’s plants or grass as you move it. The whole unit weighs 86 pounds, so it’s pretty heavy. Furthermore, to help the penetration and opening of the surface more, the unit features a weight tray which you can fill sand bags or concrete blocks. The tray can hold a weight of up to 175 pounds. Combined with the 86 pounds weight of the unit, it will offer enough weight and force to push the tines even further deep into the lawn. It’s a unit that will handle the toughest of turfs. With a wide 48 inch base, you will manage to cover a relatively large area quite easily and quickly with this Agri-Fab pull behind core aerator. Handling the unit is very easy as well. It has an ergonomically designed cantilever transport handle that you can easily reach from the driver’s seat of the tractor. It makes raising and lowering the tines a breeze. Agri-Fab have also ensure that the design this aerator for easy mobility. It’s equipped with 10 x 4 inches wide pneumatic flat tires that allow for a smooth manoeuvrability even on rough surfaces. They are quite wide and will keep the machine stable throughout the process. It will aerate every corner effectively regardless of the terrain you have in your lawn. It can even work efficiently on uneven ground without tilting or bouncing and missing large portions. Attaching the cantilever transport system of this Agri-Fab 45-0299 model to your lawn mower or ATV won’t present any challenge either. Its universal hitch allows you to hook it easily to almost any brand of tractor in just a matter of seconds. The whole construction is made up of a heavy-gauge steel which ensures optimum durability. However, it will take a bit of time like around 2 hours to put it together. The good thing though is that a video guide with very clear instructions is available to help you out. To sum it all, the Agri-Fab 45-0299 is a unit that will give you great value for your money. It’s a heavy-duty aerator that will do an amazing job on highly compacted soil including in clay conditions. It will deliver even where you least expect it. If you are planning to do some serious aerating on your lawn, then the Brinly SA-40BH is the unit you might want to get. This is the best tow behind spike aerator we’ve reviewed. The quality of the design and spikes speaks volume of how heavy duty and efficient this unit is. Whether you are dealing with heavy clay soil and or highly compacted soil, the PA-40BH will provide great performance and efficiency. The unit features 10 galvanized steel tine stars each with 12 spike tips that are very strong and super sharp. They will dig deep into any heavily compacted soil quickly and with great ease. The tines are really sharp and will penetrate the soil to a depth of up 2 inches which is enough to provide sufficient access for air, water and nutrients to reach the roots. To further enhance its effectiveness in soil penetration, a durable steel tray has been included and it has the capacity to hold up to 110 pounds. This additional weight combined with 27 pounds of the whole unit makes it quite heavy allowing it to achieve maximum penetration in hard soil. The aerator is 40-inch, so it’s wide and as such it can cover fairly large area giving you much convenience especially if you are dealing with a big plot of lawn. Even much better, each of the 8-inch tine star rotate independently and they continue to revolve during tractor turns which results to fewer missed areas hence reducing the need for redoing the aeration over and over again. Regardless of your lawn mower or tractor, attaching this Brinly SA-40BH aerator will be effortless as it features a universal hitch pin design which attaches easily to most lawn tractors. Made of 14 gauge stainless steel, this unit is also solidly built to endure great abuse and heavy workloads for many years. It’s very durable and will serve you for a quite a long time. When it comes to installation, like the Agri-Fab 45-0299 above it’s easy but the only downside is that it will as well take some time to get it ready for work. Overall, if you have big plot of lawn, farm or ranch that other compact manual aerators can’t handle, then the Brinly SA-40BH tow behind spike aerator is certainly the type of tool to go for. It’s a top quality aerator that will handle hard tasks in the most efficient way. 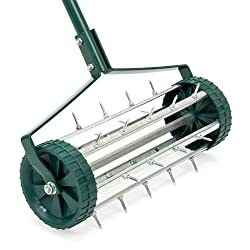 Closing our list is the Strongway aerator which is our top pick for the best drum spike aerator a title it earns for its easy to use design and high-performing drum system. If you are thinking of investing in a lawn roller that can handle a larger area, then this is an option should consider. The unit has a 14 inch diameter drum covered all over with 78 separate 3 inch long thick spikes that have very sharp ends. The spikes are tough and with their super sharp ends, they will easily penetrate into the ground while rolling. They can reach up to 2 ½ inches deep which is enough depth to create room for water, minerals and air to reach the roots. The drum itself can hold around 25 gallons of water which translates to about 299 pounds. Considering that the unit weighs 125 pounds, once you fill up the drum, it will certainly result to a rigid weight that will make the spikes to penetrate the soil even much deeper. The pressure it will provide is enough to aerate the hardest compacted soil or clay. Furthermore, the drum is 36 inches wide and as such it can cover a large area with every pass. You won’t have to keep moving up and down the lawn to get it completely aerated and it will help speed up the aerating process. The unit is also simple to use as it features a pin-style hitch that makes it easier to attach it to your tractor. In terms of built quality, everything form the drum and spikes to the frame consists of a rugged sturdy metal construction. Therefore, it will no doubt withstand great abuse and the frame is powder coated to prevent corrosion hence it will serve you for many years. In general, this a solid, heavy-duty drum spike aerator that’s capable of tackling the hardest, compacted soil on your lawn. The additional water makes it even more efficient, so it’s definitely a manual aerator that you can expect to deliver excellent results. Manual lawn aerators come in a wide variety of design and quality and in order to ensure that you invest your money on the perfect model that will address your exact needs, there are essential factors that you will want to consider. The following are some key considerations that can help you make a more informed wise buying decision. The first thing you should do before moving to buy a manual lawn aerator is knowing the size of the land you are planning to aerate and how often you intent to aerate. This is very important because the size of your lawn will greatly determine the type of aerator you can use on it. If you have a large lawn or plot of land, a narrow machine will take longer and much effort to aerate. Therefore, you would want to go for a larger equipment that’s wide enough to cover more ground quickly with minimal effort. In this case, a good option might be a tow behind lawn aerator like the Agri-Fab 45-0299 and Brinly SA-40BH on our list. A wider drum aerator like the Strongway model above is also a good option. On the other hand if your lawn is smaller, it may require basic aeration and a larger lawn may be difficult to maneuver around. Smaller lawn aerators like handheld aerators, walk behind aerators and aerator shoes would do fine in this case. Some good examples from our list are Panchau aerator shoes, the Yard Butler ID-6C hand held lawn coring aerator and the Best Choice Products rolling lawn aerator. They are perfect for smaller lawns that don’t need some serious aeration. It’s also vital to check soil type in your lawn and its current condition prior to selecting a manual lawn aerator. This well help determine to a great degree the level of compaction you are going to deal with. Clay soil tend to have a higher degree of compaction due to the fine particles and as such they can be a bit tricky to deal with. A good option to use here would be a spike aerator. Sandy soil however are not as dense as clays soils, so they tend to be less compacted. The ideal aerator to use on this soil type is a core aerator, but a spike aerator will also do fine. A spike aerator is also the best choice if you have loamy soil in your lawn. If it’s really in bad condition or heavily compacted, then you will need a unit that can handle rugged work. An equipment that’s fairly heavy and an ideal choice here is either a tow behind lawn aerator or rolling lawn aerator. Ensure also to take into consideration the amount of traffic your lawn gets because the more the traffic, the more compacted its soil will be. Once you’ve determine the kind of aerator you need to get, the next important think you should focus on is the quality and durability of the models you are considering. You don’t want to spend your money on a flimsy unit that will break down after a couple of weeks. Look for an equipment that will serve you for long and give you value for your money. A product that has a sturdy body or frame preferably made of steel, reinforced or galvanised. Stainless steel is a much better option because it’s strong and guarantees durability. There are also some aerators made from plastic such as plastic rollers. You try as much as possible to avoid them since they tend to break easily over time. If you are planning to get aerator shoes, ensure that the straps are heavy duty and the buckles are metallic. Plastic buckles will break easily. Also look at the base and make sure it’s made of a heavy gauge plastic that will stand the abuse and last long. Note that it’s better to pay a little extra buck for a quality aerator that can last long than trying to save money and end up only to spend more. The means of aeration is a critical feature that will determine the effectiveness of the aerator. It varies from one unit to another. Some come with pikes, and others feature plugs/cores. If you are going for a spike lawn aerators then you should consider the length and sharpness of its spikes because it will determine how deep and easily the aerator will penetrate through the soil. You want to make sure that the spikes’ depth can reach at least two inches below the soil surface so as to get better results. Additionally you will want to look at the strength of spikes. They should be quite sturdy and well secured. For plug aerators, aside from their length and strength consider too the amount of plug they can remove with single pass. This will determine the size of holes they create in the soil. A good plug aerator should at least remove around two inches of plug. Another essential thing to take into consideration with regards to means of aeration is the width of the edges. A unit will with a wider aeration base accomplish much work and within a short time. It would be a great option especially if you have a fairly large lawn.